Background: Sickle cell disease (SCD) constitutes an important health problem in the Eastern Mediterranean countries including Iraq. Previous studies from northern Iraq had focused on various aspects of these hemoglobinopathies, but none focused on response of these patients to hemoglobin F modulating agents. Patients and Methods: In this prospective study, a total of 106 patients with SCD were enrolled. They were aged 5–56 years (median 19.2 years) with a male to female ratio of 2.1:1.0. 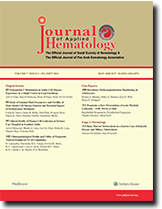 The patients were initiated on hydroxycarbamide and evaluated clinically and hematologically for response prior to therapy, at 2 and 6 months post-therapy, and at last follow-up. Results: Out of the 106 patients enrolled, 100 (94%) patients had a significant response. The responders showed a significant increase in their total hemoglobin (Hb), mean corpuscular volume (MCV), and fetal hemoglobin (HbF), reduction in their blood requirement, and vaso-occlusive crises. The therapy was quite well tolerated and there were very limited number of side effects. After a median follow-up of 4 years and 7 months (range 1–9 years), those responders at 6 months continued to do so, with 72% remaining transfusion free at their last follow-up. Conclusion: The remarkable response to hydroxycarbamide in the enrolled patients is consistent with other studies worldwide, and thereby hydroxycarbamide offers itself as a cost-effective first-line management option in SCD patients in developing countries. Context: Male sickle-cell disease (SCD) patients often have moderate to severe hypogonadism resulting in abnormal seminal fluid parameters. Hydroxyurea (HU) used in SCD patients has been found to further aggravate the testicular dysfunction. Aims: To study the seminal fluid parameters and fertility of male SCD patients and to evaluate the potential impact of HU treatment on the above factors. Settings and Design: This was a prospective study of 100 male SCD patients of age group 18 to 45 years. Materials and Methods: Seminal fluid analysis was done before starting low dose of HU (10 mg/kg/day) and every 3 months after initiation of HU. Patients with abnormal seminal parameters before HU therapy were not given HU therapy. In SCD patients with HU therapy, who developed abnormal seminal fluid parameters, HU was stopped for 3 months and seminal fluid parameters were re-evaluated. Results: Among SCD patients without HU therapy, nine (18%) patients developed oligospermia and two (4%) developed azoospermia. Among SCD patients with HU therapy, 10 (20%) patients developed oligospermia and five (10%) developed azoospermia. Seminal fluid parameters reverted to normal after stoppage of HU for 3 months in 73% of patients. Conclusions: Alteration of sperm parameters is seen in a significant number of SCD patients. Also, alterations of seminal fluid parameters are exacerbated by HU treatment even with low dose. Introduction: Plasma cell dyscrasias represent 1.4–2% of all malignancies and among hematologic malignancies; it constitutes 10% of the tumors. Plasma cell dyscrasias are composed of multiple myeloma (MM), and primary and secondary plasma cell leukemia. Materials and Methods: Primary plasma cell leukemia (pPCL) is a rare and aggressive disease, representing 1–4% of plasma cell dyscrasias. Results: The prognosis of this is very poor with median survival of 8–11 months in different reported series. Discussion: We are reporting a study from our hospital over a period of 8 years and 9 months, in which pPCL was found in 1.8% of MM patients, with slight male predominance and earlier age than MM, and all had high disease burden with high lactate dehydrogenase (LDH), β2-microglobulin, and plasmacytosis. Conclusion: This disease had very aggressive behavior, especially with light chain lambda disease, and all patients succumbed within 8 months of treatment. Introduction: With the availability of three prognostic scores in Peripheral T-Cell Lymphoma (PTCL)-International Prognostic Index (IPI), International Peripheral T-Cell Lymphoma Project (IPTCLP), and Prognostic Index for PTCL-Unspecified (PIT), we intended to find out usefulness of each of them in prognostication of patients. Objectives were to know the clinicopathological profile and to analyze the effectiveness of these prognostic scores and their individual parameters in predicting Complete Remission (CR) rates, Progression Free Survival (PFS), and Overall Survival (OS) in PTCL. Materials and Methods: All 55 patients were treated as per institute chemotherapeutic protocols. Response assessment was done by Cheson’s criteria. At baseline, patients were risk stratified with the three scores into low, low- and high-intermediate, and high-risk groups. Outcomes − CR and survival − PFS and OS were analyzed and compared in the risk groups as stratified by the three prognostic scores. Clinical and pathological details were also analyzed. Results: For PFS estimation, IPI and IPTCLP scores proved be the best prognostic tools. For OS, IPTCLP score emerged to be the single best prognostic tool. CR correlated with Ann Arbor stage of disease and IPI score. Conclusion: PTCL NOS (Not Otherwise Specified) was the most common histological subtype. IPI score correlated the best with CR reflecting as PFS, but was not related statistically with OS in the local population. IPTCLP score has consistent correlation with prognosis more so with OS than PFS, but no relationship with CR rate. Methemoglobinemia is an uncommon cause of cyanosis that may present at any age. Although acquired methemoglobinemia secondary to exposure to oxidative stressors is the most common cause of methemoglobinemia in adults, hereditary methemoglobinemia has to be considered in patients presenting with cyanosis during infancy and childhood. 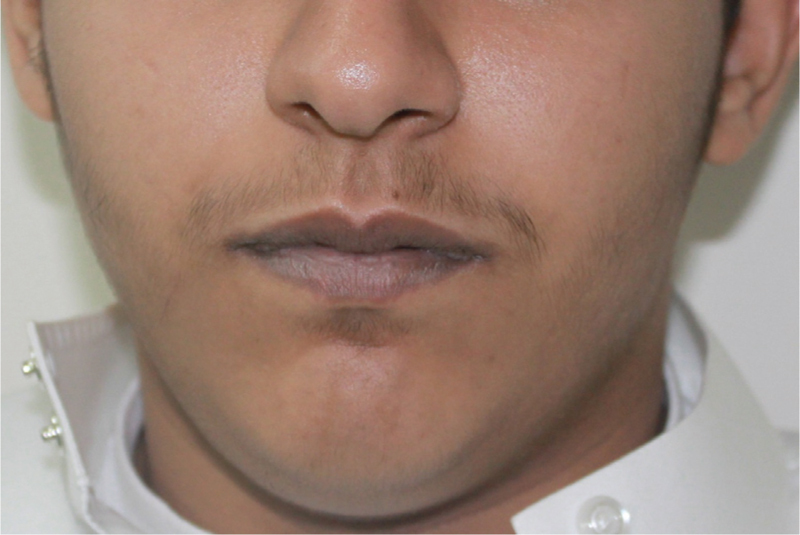 We report the case of a patient who was investigated for cyanosis that was only noted at the age of 15 years. Despite the negative family history, he was diagnosed with hereditary autosomal recessive methemoglobinemia with no other factors that can be identified to cause such an elevation of methemoglobin level. 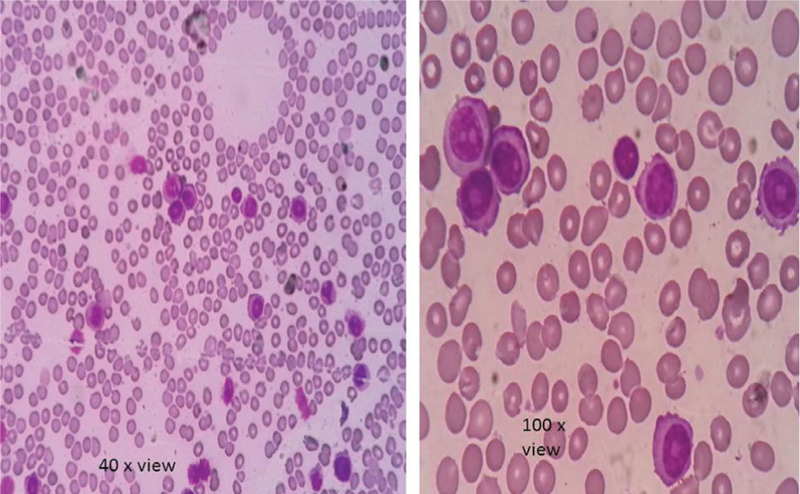 This case illustrates that hereditary methemoglobinemia has to be considered in such patients even if they were completely asymptomatic for many years of their lives. Acute myeloid leukemia (AML) M6 or acute erythroid leukemia is an extremely rare type of AML accounting for 3–4% of all AML cases. In children, AML is even rarer, in accordance to the fact that only 0.5–4.6% of all cancer-affected individuals are children. Proptosis as a sign of AML is well noted; however, proptosis as an extramedullary symptom in the case of AML M6 is very rare. 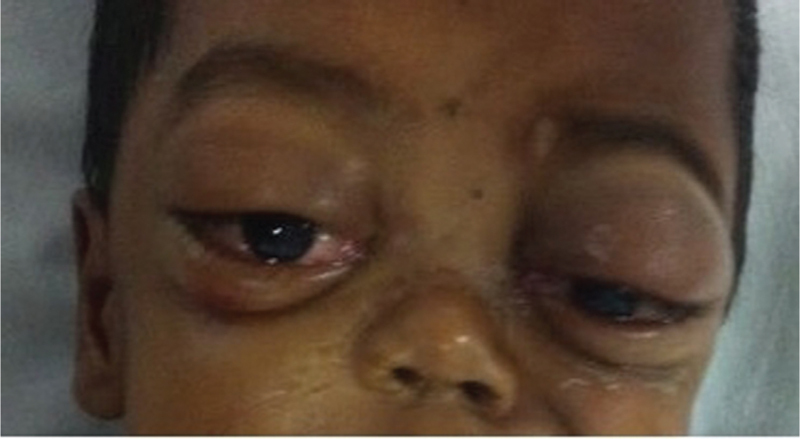 A 3-year-old male child presented with bilateral proptosis. 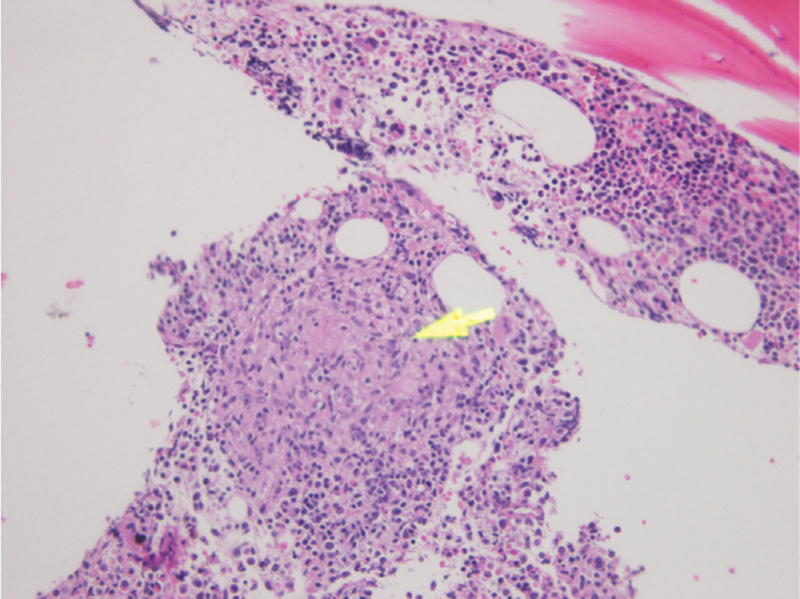 Bone marrow aspirate predominantly showed blasts, which by flow cytometry were concluded to be AML M6. Proptosis as an extramedullary presentation in the case of AML M6 in the pediatric age group was not reported in literature. We are presenting our case for its rarity.